This years holiday theme is coffee. Yes I do themes for Christmas and the tree this year is decorated with Starbucks ornaments and cards, coffee items, marshmallow snowflakes the girls made, and gold, silver, and red balls. Our advent calendar is white coffee cups that I painted with dots and stripes and have numbers on them that go down the center of our dining room table on a silver sequin table runner. So when thinking about cookies and goodies we have our coffee themed sugar cookies which include coffee beans, hot chocolate cups, coffee cups, and to go coffee cups. I found the cookie cutters last year which is what decided the theme. I also decided to make biscotti but couldn’t nail down the flavors or keep it to just a couple batches so we made a lot but apparently 8 plus batches isn’t enough because it is gone like that! So I am sharing them all with you, including the failed batch! I probably need to attend some Baking Classes in Delhi to improve my baking skills! I Yes I said failed batch and I bet you are wondering why I am sharing it… well because it seems to be everyone’s favorite! Not in terms of texture or biscotti but even non biscotti fans love it and it is more of a biscotti cookie or brittle or I am not sure what to call it but it is biscotti I made with candy cane pieces and marshmallows and it didn’t thick and it is thin and crunchy yet chewy and multiple batches came out that way. I am pretty sure it is due to the amount and combination of marshmallows and candy canes and it looked like a hot mess but once it was cut and re baked, and melted and oozed again it still is a hit and a fail. So yesterday I went and made more biscotti because well Christmas is in a few days and we have people coming and we have been blowing through it eating it and sharing. I played around and updated the recipe, well noted, that using more all purpose flour and less almond flour it turned out better and almost spot on with the others being a true biscotti but still with the marshmallows and where they end up and not wanting to reduce them it is still slightly thinner than the others (not as thin as in the photos at all) but honestly the funny thing is we are addicted and still loving the “failed” biscotti brittle! It is this perfect chewy treat when dipped in coffee that I just wish I could describe. We also made another batch of peppermint chocolate chip without the cacao so I will be adding that to the list below and will try to get a photo up on here otherwise you can find one on Instagram! Back to the good batches…. We have Chocolate Peppermint, Peppermint Mocha, S’more, S’more Mocha, and Cranberry Eggnog. The mocha ones have chopped espresso beans in them, yep coffee with your coffee since we are all so busy this time of year. 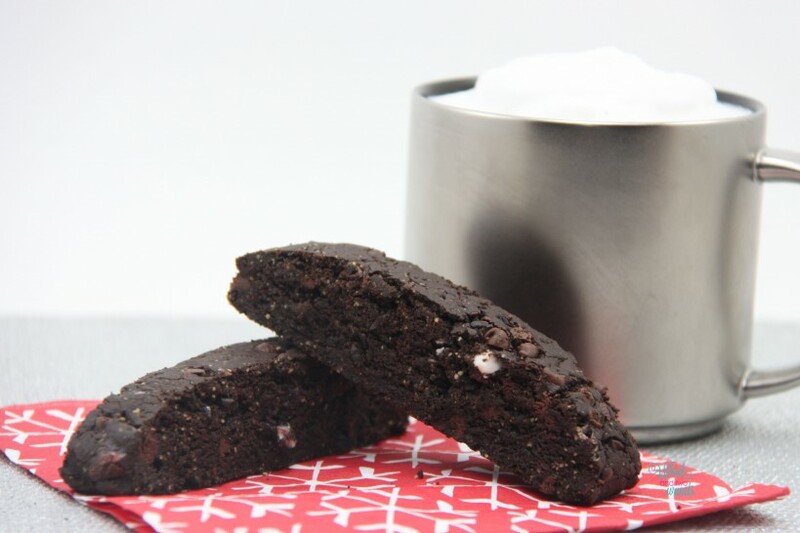 Then the Chocolate Peppermint, S’more, and Cranberry Eggnog for just good tasting biscotti to enjoy with your coffee or tea on Christmas Eve, Christmas morning, New Years or anytime you wish. Not a coffee fan these are still a delicious addition to any dessert or snack plate. What is your favorite treat to enjoy with coffee? *Not pictured Chocolate Chip Peppermint (no cocoa, so white/vanilla biscotti like the Eggnog versions) omit cocoa powder and instead add an extra 1/2 cup of all purpose flour or almond meal. 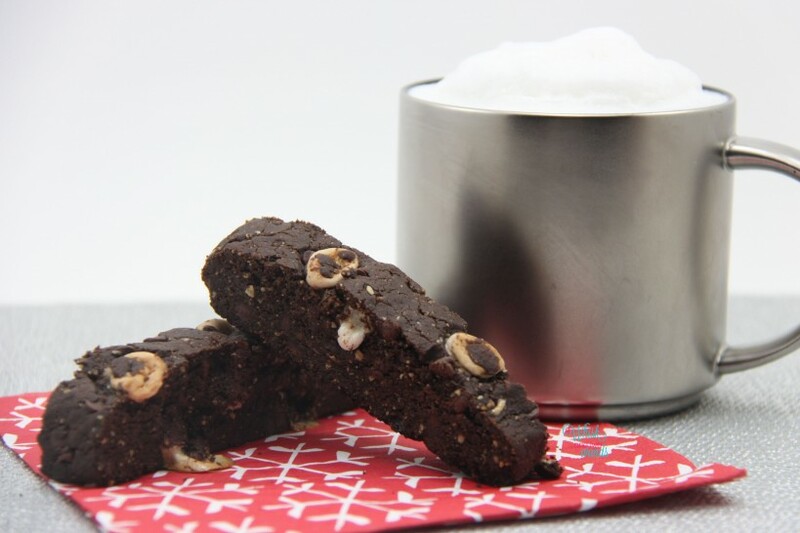 Add in 1/2 cup dark chocolate, carob, or chopped chocolate of choice and 1/3-1/2 cup of chopped peppermint candy canes. Preheat the oven to 350F. Line a baking sheet with non-stick baking paper. In a large bowl, whisk together the milk and flaxseed. Whisk in the oil, sugar, and vanilla until smooth. Sift in the flours, cocoa powder, baking powder, and salt. Knead in add ins depending on the flavor you are making. Place the dough on the prepared baking sheet and form a log about 10 inches long by 4 inches wide. Use a silicon spatula to level it out and round the edges. Bake for 30 minutes until the log is puffed and firm. Some cracking is okay. Place the baking sheet on a wire rack, turn off the oven and allow the log to cool for at least an hour. Preheat the oven to 325F. Very carefully slide the log off the baking sheet and onto a cutting board. With a long, sharp, heavy knife cut the log into 12 slices, using one quick and firm motion, pressing down into the log. I start in the center cutting in half, each half in half, and then the four sections into thirds. Very gently move the slices back onto the baking sheet, standing them on their bottom edge. Bake the slices for 26-28 minutes (they should appear dry, though the choc chips will still be wet and melted). Allow the biscotti to cool 10 minutes on the baking sheet, then carefully move them to a wire rack to complete cooling, the warm biscotti will be fragile. 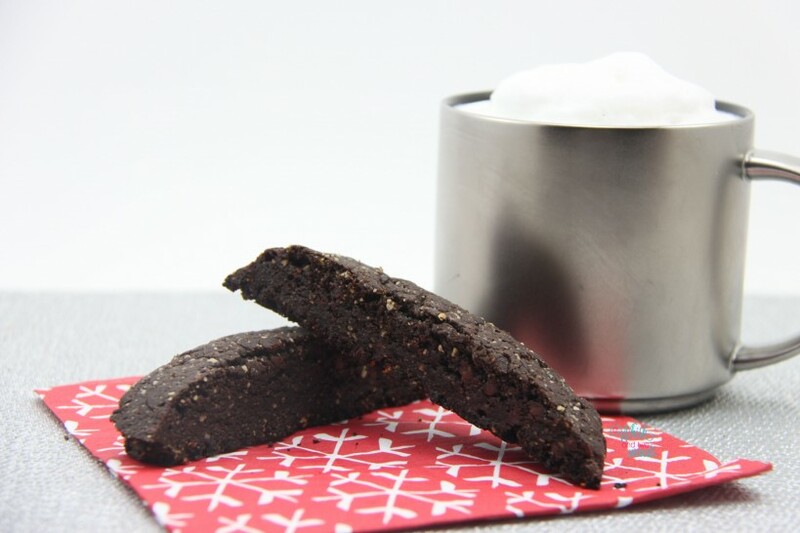 Once biscotti has cooled completely place in and airtight container. Enjoy! In a large bowl, whisk together the milk and flaxseed. Whisk in the oil, sugar, and vanilla until smooth. Sift in the flours, baking powder, salt, cinnamon, and nutmeg. Knead in cranberries. 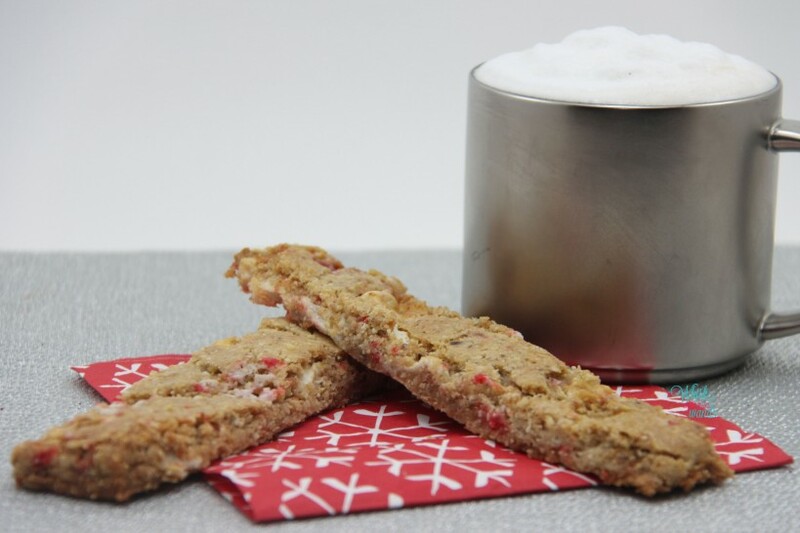 *For a truer biscotti texture that is thicker and less chewy use 1 1/2 cups of all purpose flour and 1/2 cup of almond meal. In a large bowl, whisk together the milk and flaxseed. Whisk in the oil, sugar, and vanilla until smooth. Sift in the flours, baking powder, and salt. Knead in marshmallows and candy cane pieces. I need to make biscotti!!!! 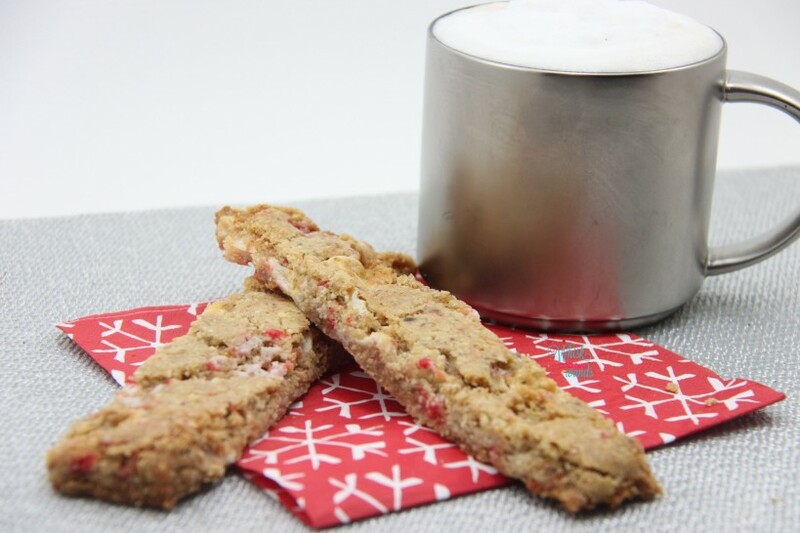 i can’t decide which looks better – the cranberry or the marshmallow biscotti! Linz @ Itz Linz recently posted…‘Twas a marvelous weekend! Depends but the marshmallow is my favorite right now. I could go Cranberry with tea or an eggnog latte! you are SO talented! I always look forward to your recipes, and this is another awesome one! 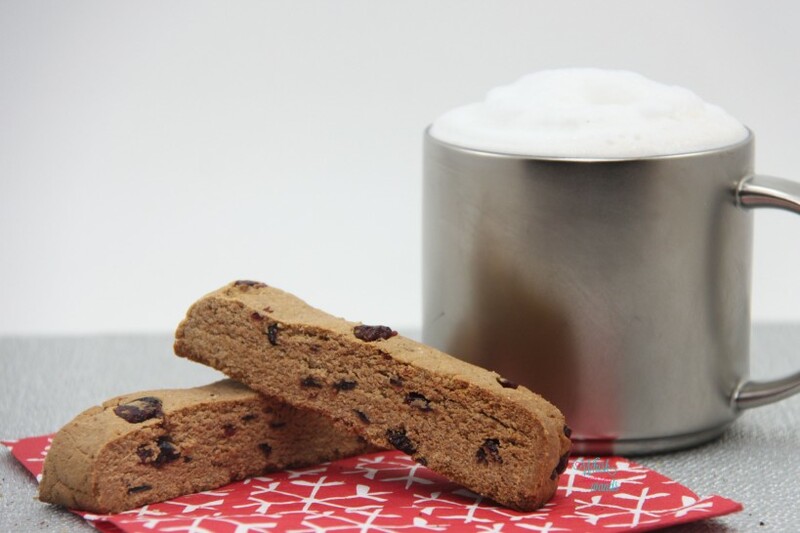 I have always wondered how to make biscotti….now I know, and in so many wonderful flavors! Thanks for the recipe, and thanks for joining us for meatless monday, I can’t wait to see what 2015 has you bring each week! Thank you Tina!! It is so easy and now that you know you have to try it! Thank you for hosting I will have to kick my husband out of the kitchen and get in there and whip up some new creations for the new year! ooh another yummy looking dessert. I’m loving the looks of the mocha smore. They don’t look too unhealthy either thanks for linking up with us again for MM. I love the coffee theme. 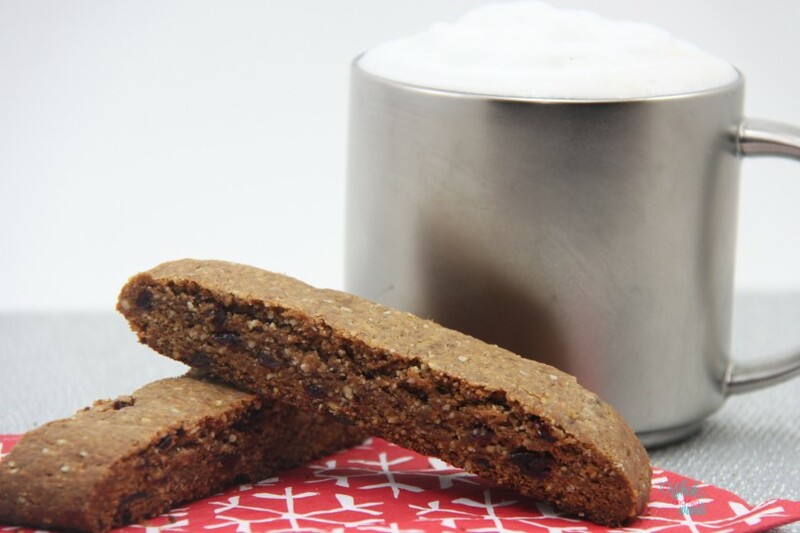 Nope not a dessert, biscotti for breakfast! 😉 Shh don’t tell anyone I have been enjoying it with coffee or an adult coffee at night! I don’t know how I feel about biscottis because I think I like to munch on something softer, not something too crunchy. To be honest though, I don’t even think I have had a biscotti so I could just be talking out of my booty! LMFAO!!! These sound scrumptious though!